Just regular folks. : The real halloween costumes. I am in bed with Edda on Halloween night. This is her "real" costume. I was still sewing it as of yesterday morning. 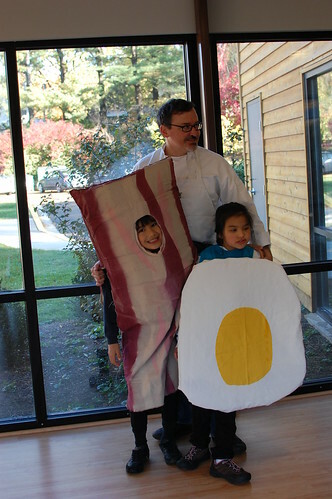 We made it down the block so we could show off our themed costume of bacon, egg and chef to a few of our neighbors. Now Vince and Jeremy are out on the massive candy run. Vince plotted out the route this morning on Google maps. I wonder if they will make it home before nine.